On a typical Saturday morning, no matter what I am doing, one thing is for certain: The TV will be on in every room and it will be on one channel….The Food Network Channel. 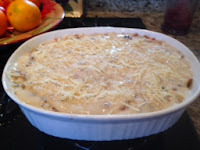 I find that I can get recipe ideas while I am doing simple household chores and look out for those that catch my eye. Such is the case last Saturday when Trisha’s Southern Kitchen was airing and her Baked Spaghetti captured my attention! Now normally, this is not something that I would be drawn to since Jeff and I process our own homemade spaghetti sauce in the summer. 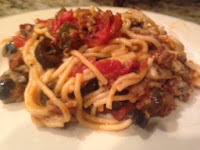 The Pitt Italian Sauce is hard to beat as a spaghetti option but still something about this recipe seemed tantalizing. After reading the recipe, it seemed pretty solid but I knew I would have to kick up the flavor just a bit based on our tastes. The results are in……….. Directions Preheat the oven to 350 degrees F. Grease a 9-by-13-by-2-inch baking dish with cooking spray. In a large skillet, cook the bacon until slightly crisp. With a slotted spoon, transfer the bacon to a paper-towel-lined plate to drain. Place half of the spaghetti in the prepared baking dish; top with half of the vegetable-beef mixture; and sprinkle with 1 cup of the cheddar. Repeat the layers. In a bowl, stir together the cream of mushroom soup and 1/4 cup water until smooth, and pour this over the casserole. 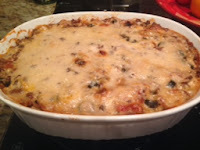 Sprinkle with the Parmesan and bake, uncovered, for 30 to 35 minutes, or until heated through. Bottom Line: This was delicious and other than the addition of a couple of my own ingredients, I wouldn’t change a thing! Thank you, Trisha! Kid-Friendly and Hubby-Approved! !